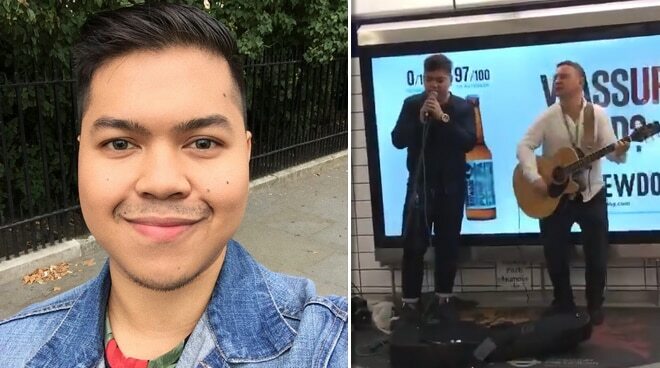 Rhap Salazar earns praise as he busked in a subway in London. Former Little Big Star contestant and 13th World Championships of Performing Arts two-time winner Rhap Salazar may have momentarily left the spotlight, but his passion for music has unquestionably continued to burn from within as he recently flew to the UK to perform for his fans in an intimate venue in London. Rhap, who felt grateful for the opportunity to have a solo show for the first time, also shared how ecstatic he was to have had the chance to busk or perform in a subway in London. He ticked it off his bucket list with a performance of British singer-songwriter Sam Smith's "Stay With Me." "We were on our way home when my friend asked me to sing with this guy in the train station. It was a fun and memorable experience! Thank you Yco for capturing my instant busker moment," he wrote on Twitter.